Colobus monkeys spend almost their entire lives up in the branches, rarely touching the ground. 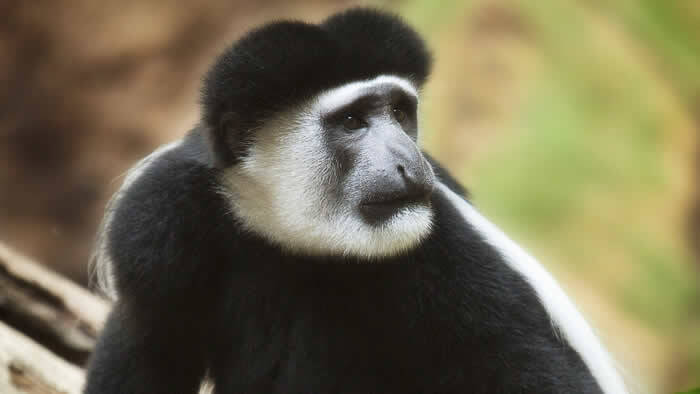 Unlike other primates, colobus monkeys’ cow-like stomachs allow them to subsist on a leafy diet. They don’t even need to come down for water, finding enough in the treetops to survive. Tender, high-protein leaves from forest trees are black and white colobus monkeys’ favorite food. They also eat unripe fruit, seeds, flowers, and bark. Black and white colobus make their home high in the trees of a variety of tropical African forests. Black and white colobus monkeys spend their days eating, relaxing, and socializing with each other, generally without squabbling. Males defend their group and its territory from others with roars, tongue-clicks, chases, and an unusual stiff-legged display. Because individual family groups need only a small patch of forest, black and white colobus can coexist near people when clusters of trees remain intact. In some areas of tropical Africa, these small forest fragments are disappearing rapidly, however. 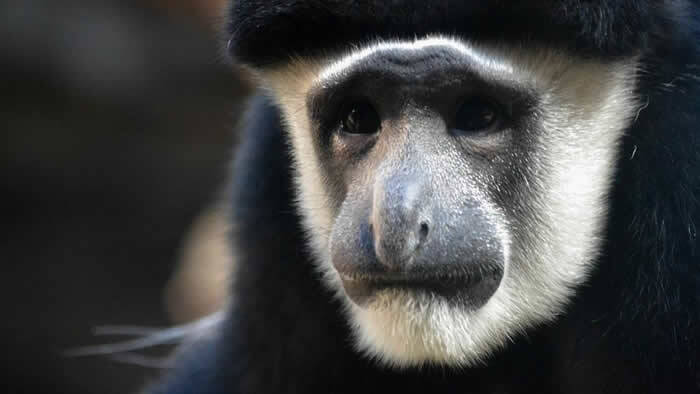 The word ‘colobus’ derives from the Greek word for ‘mutilated.’ They were given this name by European biologists because they lack functional thumbs. The male head of a colobus group announces its presence and location each morning with a series of loud, long roars. The practice of eating leaves is called folivory. Black and white colobus monkeys are occasionally hunted for their striking fur, which has been used for everything from costumes and coat trim to rugs. 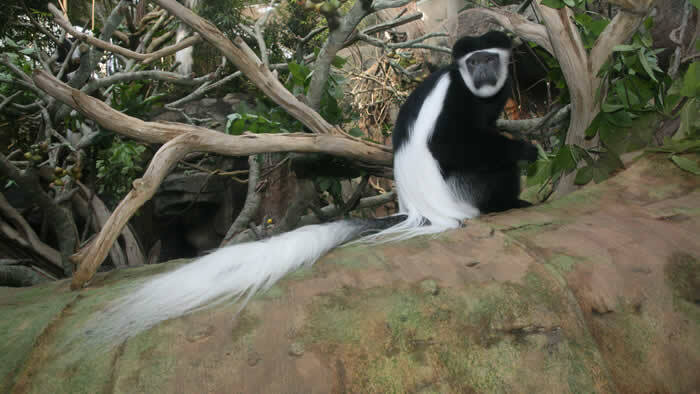 Colobus monkeys have multi-chambered stomachs that allow them to digest leaves and unripe fruit other monkeys can’t. Support African forests and the black and white colobus monkey. Although sometimes captured for their fur, black and white colobus monkeys are not considered threatened by people. They are often able to thrive in small pockets of habitat in between human settlements but are sometimes killed when they try to move between forest fragments. The Zoo has provided funds to support primate patrolling and monitoring on Bioko Island, Equatorial Guinea. Bioko Island is a small island (2000 km2) twenty miles off the coast of Cameroon in West Africa. It is home to the capital city of Equatorial Guinea, 150,000 people, and some of the most endangered animals on Earth. Threatened primates include: Pennant’s red colobus monkey (Procolobus pennanti pennanti: designated by IUCN’s Primate Specialist Group as one of the 25 most endangered primates in the world), the Bioko black colobus monkey (Colobus satanus satanus), Stampfli’s greater spot-nosed guenon (Cercopithecus nictitans stampflii), Preuss’ guenon (Cercopithecus preussi), Bioko red-eared guenon (Cercopithecus erythrotis erythrotis), crowned guenon (Cercopithecus pogonias pogonias), and the drill (Mandrillus leucophaeus). In the 1980s, the capital city of Malabo at the northern end of Bioko became home to a commercial bushmeat market, selling monkeys, duikers, sea turtles, monitor lizards, and other large animals. Since then, wildlife has largely disappeared from the northern half of the island. At the island’s southern end, the Gran Caldera – a hollowed out volcanic crater, shields many animals from hunters with its steep gorges. As bushmeat supply decreases, however, and prices increase, hunters are making riskier and longer treks into the southern forests. This project, run by the Bioko Biodiversity Protection Program, coordinates seven wildlife patrolling and monitoring teams in an effort to protect the island’s remaining wildlife and keep commercial bushmeat hunters out of protected areas. In 2008 and 2009, the Minnesota Zoo provided funding through the Ulysses S. Seal Conservation Grant Program to help keep these patrols running.